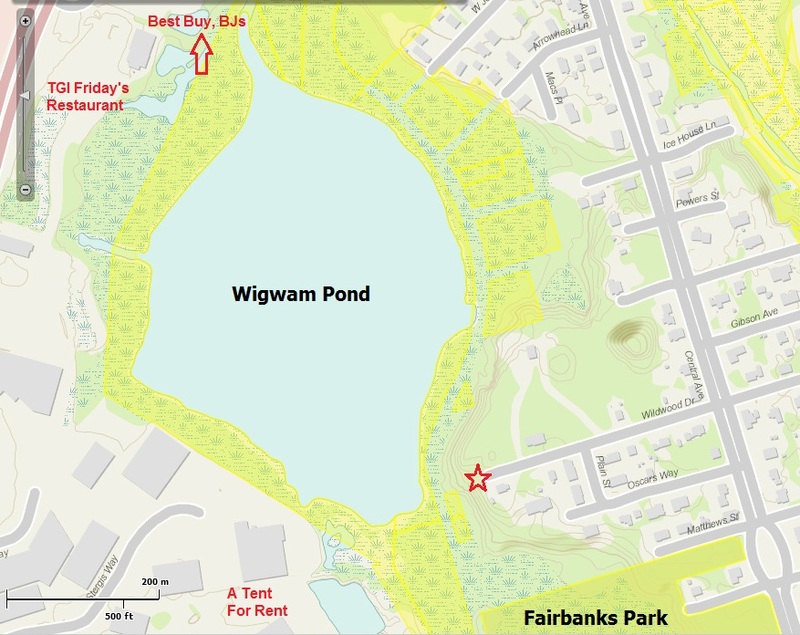 Wigwam Pond is a hidden gem that sits behind the box stores on Providence Highway. There is limited access to the pond from several parking lots, and a few streets in the Fairbanks neighborhood on the east side of the pond. To access the wooded area on the east side, park in the lot at Fairbanks Park (street address 169 Rustcraft Road, Dedham) and walk up the hill along the fence next to the field. Some of the woods are easy to navigate, as residents have established paths to get to Fairbanks Field. Other areas are a bit more daunting, with obstacles such as large patches of greenbriar, huge piles of yard waste, steep cliffs, and even a chicken coop. Do not be afraid when you stumble upon the fake deer that was once used for target practice. Every time I see it, I get a bit freaked out. It’s fake. It’s harmless. Wear long pants and sturdy boots. Bring sunscreen, insect repellent, and plenty of water to drink. What you might see: trees (willows, birch, beech, ash), wildflowers, cat-tails, frogs, dragonflies, grasses, sedges, rushes, ferns.